1. James Barrick, Keyser W. Va.
James Barrick, Keyser W. Va. Portrait of James Barrick from a photograph album of images from the late nineteenth century featuring residents from Keyser, W. Va.
3. Portrait of Lucy Carskadon Fitzer from Keyser, W. Va. 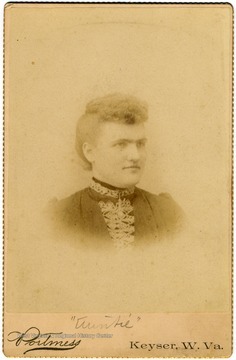 Portrait of Lucy Carskadon Fitzer from Keyser, W. Va. Portrait of Lucy Carskadon Fitzer fromfrom a photograph album of late nineteenth century images featuring residents from Keyser, W. Va.
4. Group Portrait, Keyser, W. Va.
Group Portrait, Keyser, W. Va. 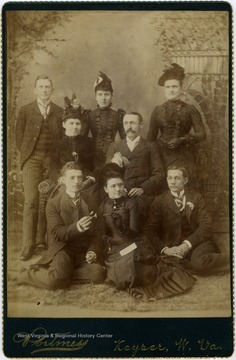 Portrait of [Clark] Hughes, Alice Carskadon, Lucy Carskadon, Jessie [Liks], Mr. Dameron , Jim Barrick, Nancy Lauck, and Charlie [Charles] Head from a photograph album of late nineteenth century images featuring residents from Keyser, W. Va.
5. Portrait of Sadie West and Nancy Lauck from Keyser, W. Va. Portrait of Sadie West and Nancy Lauck from Keyser, W. Va. 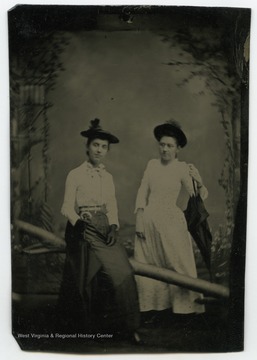 Portrait of Sadie West and Nancy Lauck from a from a photograph album of late nineteenth century images featuring residents from Keyser, W. Va.
6. Portrait of Frank and Nina Reynolds, Keyser, W. Va. 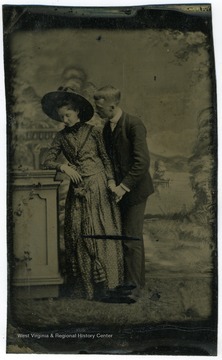 Portrait of Frank and Nina Reynolds, Keyser, W. Va. Portrait of Frank and Nina Reynolds taken during the Summer of 1888 from a photograph album of late nineteenth century images featuring residents from Keyser, W. Va.
7. Portrait of Hal Reynold, James Barrick, and Jim [Leks] from Keyser, W. Va. Portrait of Hal Reynold, James Barrick, and Jim [Leks] from Keyser, W. Va. 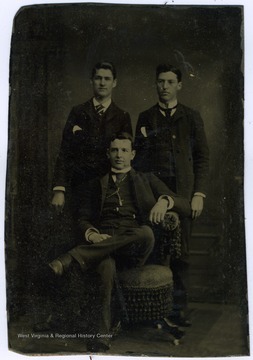 Portrait of Hal Reynold, James Barrick, and Jim [Leks] from a photograph album of late nineteenth century images featuring residents from Keyser, W. Va.
8. Portrait of Nancy Lauck and Katie Fitzer, Keyser, W. Va. Portrait of Nancy Lauck and Katie Fitzer, Keyser, W. Va. Portrait of Nancy Lauck and Katie Fitzer from a photograph album of late nineteenth century images featuring residents of Keyser, W. Va.
9. 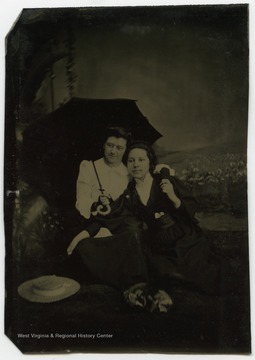 Portrait of Sadie West and Nancy Lauck, Keyser, W. Va. 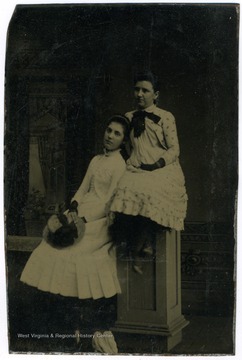 Portrait of Sadie West and Nancy Lauck, Keyser, W. Va. Portrait of Sadie West and Nancy Lauck from a photograph album of late nineteenth century images featuring residents of Keyser, W. Va.
10. Portrait of James Barrick, Sadie West, Nancy Lauck, and Nat Reynolds, Keyser, W. Va. 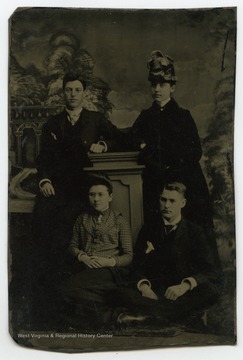 Portrait of James Barrick, Sadie West, Nancy Lauck, and Nat Reynolds, Keyser, W. Va. Portrait of James Barrick, Sadie West, Nancy Lauck. and Nat Reynolds from a photograph album of late nineteenth century images featuring residents of Keyser, W. Va.
11. 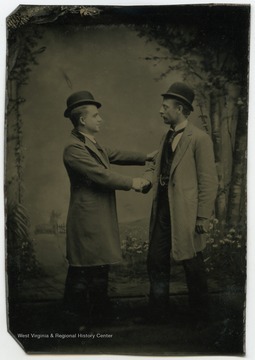 Portrait of Howard Wells and Frank Reynolds, Keyser, W. Va. Portrait of Howard Wells and Frank Reynolds, Keyser, W. Va. Portrait of Howard Wells and Frank Reynolds from a photograph album of late nineteenth century images featuring residents of Keyser, W. Va.
12. 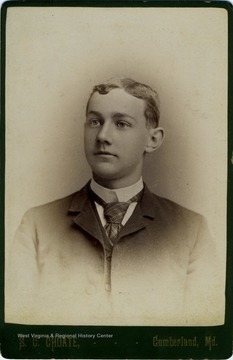 Portrait of Reverend S. M. Engle, Keyser, W. Va. 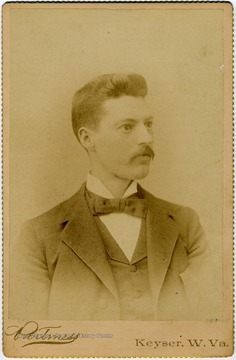 Portrait of Reverend S. M. Engle, Keyser, W. Va. 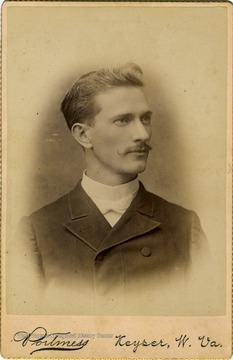 Portrait of Reverend S. M. Engle from a photograph album of late nineteenth century images featuring residents of Keyser, W. Va.